To Cite: Saberi E, Farahi F, Bijari S. Anatomical Variations of Maxillary Second Molars Palatal Root: Report of Two Cases, Dent Clin Exp J. 2017 ; 3(1):e65985. doi: 10.5812/dcej.65985. Variations in the number of roots and canals have been previously reported. Presence of two separate roots or two palatal canals in the maxillary second molars is among the rare variations encountered. This study reports two cases of maxillary second molars (first one with two separate palatal roots and the second one with one root and two palatal canals). Although these variations are extremely rare, knowledge in this respect can help in successful endodontic treatment. Negotiation, cleaning, and disinfection of root canals are important steps in endodontic treatment. Knowledge about the variations of the root canal system, particularly in multi-rooted teeth, directly affects the outcome of root canal treatment (1). Maxillary molars have wide variations of the root canal system, and studies have reported maxillary molars with one to seven root canals (1-8). The majority of available studies on the morphology of maxillary molars are case reports and case series. Many studies on maxillary second molars with large sample size have indicated that maxillary second molars usually have three separate roots (two buccal and one palatal root). Other variations, such as presence of four separate roots (two in the buccal and two in the palatal), have a very low prevalence (2, 8, 9). Peikoff et al. (9) in their retrospective study, evaluated 520 endodontically treated maxillary second molars and stated that the incidence of the second palatal root in these teeth was 1.4%. The number of the roots has not been discussed in the Vertucci classification and the prevalence of the Vertucci type II in the palatal root of second molar is reported as 0% (10). Libfeld and Rotstein (2) evaluated 1200 maxillary second molars and reported the incidence of two palatal roots to be 0.4%. Alavi et al. in 2002, reported that 100% of the palatal roots of all maxillary molars evaluated in a Thai population had three roots and type I canals (11). Sert and Bayirli (12) in 2004, evaluated variations in the morphology of the root canals of maxillary and mandibular teeth in a Turkish population using the staining and root clearing technique and reported that 100% of the palatal roots of the maxillary second molars were Vertucci type I. Another study in 2010 evaluated the morphology of the first and second maxillary molars using cone beam computed tomography (CBCT) and reported that the prevalence of maxillary first molars with four roots was 0.9% and none of the maxillary second molars had four roots. Canals were mostly type I except for the mesiobuccal and distobuccal roots that had other variations as well (13). However, more recent studies have reported different incidence rates for these variations compared to older reports, which may be due to the absence of highly accurate diagnostic tools such as CBCT in the past (14). This study aimed to report endodontic treatment of two maxillary second molars with palatal root variations (two separate palatal roots and two palatal canals in one root) and determine the prevalence of this variation in patients presenting to school of dentistry, Zahedan university of medical sciences during 2016 - 2017. Out of a total of 120 patients presenting to the endodontic department of Zahedan school of Dentistry for endodontic treatment of maxillary first and second molars during 2016 - 2017, palatal root variations were noted in two cases. Our patient was a 30-year-old male complaining of severe tooth hypersensitivity to cold and spontaneous pain in his upper left quadrant. He had a clear medical history. Intraoral examination showed a deep carious lesion at the mesial surface of tooth #15. On clinical examination, the patient had prolonged pain in response to cold test using cold spray (Monoart, Euronda, Italy). The tooth was also sensitive to heat (hot burnisher) and electric pulp tester and showed mild tenderness to percussion. The tooth was diagnosed with symptomatic irreversible pulpitis. After obtaining informed consent and administration of infiltration anesthesia by injecting 2% lidocaine plus 1/80,000 epinephrine (Persocain, DarouPakhsh, Tehran, Iran), a rubber dam was placed, caries was removed and access cavity was prepared. 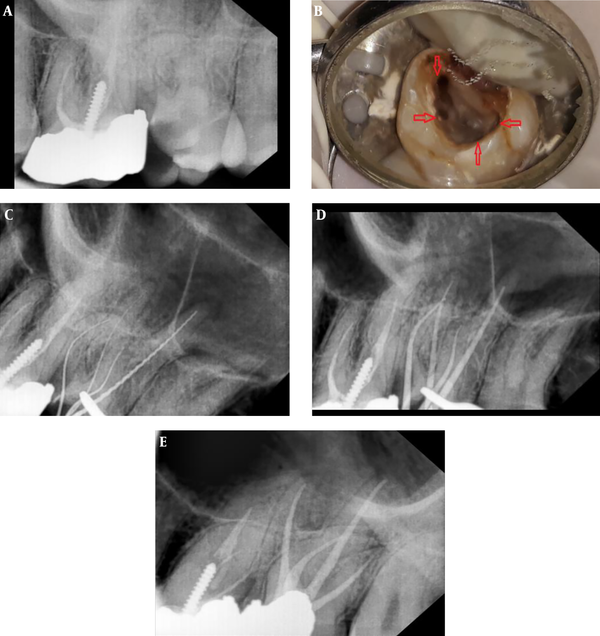 The ceiling of the pulp chamber and the coronal pulp tissue were removed, and a dental explorer (DG16, Hu-Friedy, Chicago, IL, USA) was used to negotiate the canal orifices. After detection of the main canals, the pulp chamber floor was inspected under magnification and adequate lighting using an endodontic microscope (Zeiss, Germany) and another orifice was found in the mesiopalatal area. After canal negotiation with a #15 K-file (Dentsply Maillefer, Ballaigues, Switzerland), the coronal third of the canals was flared using Race 40 (10%) orifice shaper. Working length was then determined using an apex locator (Root ZX, J. Morita, Tokyo, Japan) and radiographically confirmed. The canals were then instrumented using the Race rotary system via the crown-down technique such that the master apical file #25/0.06 was chosen for the buccal canals and #30/0.06 was chosen for the palatal canals. The canals were rinsed with 5.25% sodium hypochlorite between instrumentations. After completion of instrumentation, the canals were rinsed with EDTA (Asia Chimi Teb, Tehran, Iran) for smear layer removal followed by a final rinse with 0.9% saline. The canals were then dried with sterile paper points and filled with gutta-percha (Meta Biomed Co., Chungcheongbuk do, Korea) and AH26 sealer (Dentsply, DeTrey, Konstanz, Germany) using the lateral compaction technique. The teeth were then restored with amalgam (Sinalux, Iran). Figure 1. A, Preoperative periapical radiograph of the maxillary left second molar; B, clinical photograph of the access cavity showing four root canals; C, radiograph taken after detecting all root canals; D, radiograph taken for assessment of master cone; E, radiograph taken after completion of root canal filling. Our patient was a 35-year-old female presented to the endodontic department of school of dentistry, Zahedan university of medical sciences, complaining of spontaneous, interrupted pain in her upper right quadrant for the past month. Her medical history was unremarkable. Intraoral examination revealed carious lesions and several restorations including an occlusal filling and a proximal carious lesion in tooth #2. On clinical examination, the patient had prolonged pain following the cold test (Monoart, Euronda, Italy). The tooth was also sensitive to heat (hot burnisher) and electric pulp tester. Tooth response to percussion and palpation of the periapical region was normal. The tooth was diagnosed with symptomatic irreversible pulpitis. After obtain informed consent and induction of infiltration anesthesia by injecting 2% lidocaine with 1/80,000 epinephrine (Lidocaine, DarouPakhsh, Tehran, Iran), rubber dam was placed, caries was removed, and access cavity was prepared. The ceiling of the pulp chamber and the coronal pulp tissue were removed and canal orifices were negotiated using a dental explorer (DG16, Hu-Friedy, Chicago, IL, USA). After detection of the main canal orifices, the pulp chamber floor was inspected under magnification and adequate lighting using an endodontic microscope (Zeiss, Germany). Another orifice in the mesiopalatal region was then found. After canal negotiation using a #15 K-file (Dentsply Maillefer, Ballaigues, Switzerland), flaring of the coronal third of the canals was performed using Race 40 (10%) orifice shaper. Working length was then determined using an apex locator (Root ZX, J. Morita, Tokyo, Japan) and confirmed radiographically. The canals were then instrumented using Race rotary system with crown-down technique such that #25/0.06 master apical file was used for buccal and #30/0.06 was used for palatal canals. The canals were rinsed with 5.25% sodium hypochlorite between instrumentations. After completion of instrumentation, the canals were rinsed with EDTA (Asia Chimi Teb, Tehran, Iran) for smear layer removal followed by a final rinse with 0.9% saline. The canals were then dried with sterile paper points and filled with gutta-percha (Meta Biomed Co.,Chungcheongbuk do, Korea) and AH26 sealer (Dentsply, DeTrey, Konstanz, Germany) using the lateral compaction technique. The teeth were then temporarily restored with Cavit. Figure 2. A, Preoperative periapical radiograph of the maxillary left second molar; B clinical photograph of the access cavity showing four root canals; C and D, radiograph taken after detecting all root canals; E radiograph taken for assessment of master cone; F periapical radiograph after completion of the root canal filling. Knowledge about the anatomy and morphology of the canals helps in successful root canal treatment. In general, the prevalence of maxillary second molars with two palatal canals or two palatal roots is very low. It has been reported that an active endodontist probably encounters one case of palatal root variation of maxillary molars once every three years (15). This study reported two cases of anatomical variations of the palatal root of the maxillary second molars and determined the prevalence of palatal root variations of maxillary molars. This study showed the prevalence of variations in the palatal root to be 1.7%. Our first patient had a maxillary second molar with four separate roots, two in the buccal (mesiobuccal and distobuccal) and two in the palatal (mesiopalatal and distopalatal) side. The canal of each root was Vertucci’s type I. Our second patient had a maxillary second molar with four canals including one distobuccal, one mesiobuccal, and two palatal (mesiopalatal and distopalatal) canals. The palatal canals were Vertucci’s type II. Rouhani et al. (8) in their study on an Iranian population using CBCT stated that the most prevalent root morphology in maxillary molars was presence of three separate roots (96.8% of the cases). However, the prevalence of second molars with four roots was 1.6%. Also, the incidence of Vertucci’s type II canal in the palatal root of the maxillary first molar was 0.8% (8). The other study (16) reported the incidence of presence of two palatal roots in the maxillary molars to be 0.2% - 5.1%. They devised variations of the palatal root of these teeth as one single root with two separate canals (Vertucci’s type IV), two separate roots each with one separate canal (Vertucci’s type I), and one separate root with one canal (type V). Other studies reported the prevalence of the second canal in the palatal root to be 2.50% (in vitro), 0.62% (clinical), and 4.55% (CBCT) (17, 18). Silva et al. (19) in 2014, evaluated the morphology of the root canal system of maxillary molars using CBCT and reported the prevalence of maxillary molars with three separate roots and two canals in the palatal root to be 0.65%. Another report (9) stated that in case of presence of four canals, the orifice of the mesiopalatal canal is generally large and it is often located on a groove extending from the mesiobuccal orifice towards the disopalatal orifice. In addition, the distopalatal canal is larger and located more distally than the palatal canal in teeth with one palatal root. Moreover, in such cases, a larger access cavity (palatally extended) is required for easy access to both canals and the outline of the access cavity should be trapezoidal rather than triangular. This is particularly important when the roots are divergent. Some studies have discussed that the palatogingival groove is present in case of presence of two palatal roots in the maxillary molars (20); however, we did not detect a palatogingival groove in any of our patients. Clinicians must consider the possibility of presence of two palatal roots in cases where the image of palatal root(s) is unclear on the preoperative radiograph. CBCT with high resolution and low patient radiation dose enhances the ability of the clinicians in detection of the variations of the root canal system and curvature of the root canals. It also enables a more comprehensive assessment of danger zones (18). However, according to the European society of endodontology (ESE) and American associations of endodontists (AAE), CBCT must only be requested for cases where at least a couple of important reasons exist for taking a CBCT scan and it is cost-effective for patient (21). Patients in our study preferred to not take a CBCT scan. Considering the complexities of the root canal system, clinicians must be well aware of the possible variations of the root canals and do not limit their treatment to the standard number of canals due to the fact that 42% of teeth with untreated roots/canals will require endodontic re-treatment (22). Conflict of Interests: The authors declare that there is no conflict of interest regarding the publication of this paper. 1. Setzer FC, Boyer KR, Jeppson JR, Karabucak B, Kim S. Long-term prognosis of endodontically treated teeth: a retrospective analysis of preoperative factors in molars. J Endod. 2011;37(1):21-5. doi: 10.1016/j.joen.2010.10.005. [PubMed: 21146070]. 2. Libfeld H, Rotstein I. Incidence of four-rooted maxillary second molars: Literature review and radiographic survey of 1,200 teeth. J Endod. 1989;15(3):129-31. doi: 10.1016/s0099-2399(89)80134-7. 3. Badole GP, Warhadpande MM, Shenoi PR, Lachure C, Badole SG. A rare root canal configuration of bilateral maxillary first molar with 7 root canals diagnosed using cone-beam computed tomographic scanning: a case report. J Endod. 2014;40(2):296-301. doi: 10.1016/j.joen.2013.09.004. [PubMed: 24461422]. 4. Parirokh M, Abbott PV, Yosefi MH, Hosseini HR. Presence of two distal and one mesial root canals in mandibular second molars: report of four cases. Iran Endod J. 2014;9(3):229-32. [PubMed: 25031600]. [PubMed Central: PMC4099958]. 5. Asghari V, Rahimi S, Ghasemi N, Talebzadeh B, Norlouoni A. Treatment of a Maxillary First Molar with Two Palatal Roots. Iran Endod J. 2015;10(4):287-9. doi: 10.7508/iej.2015.04.016. [PubMed: 26523146]. [PubMed Central: PMC4609671]. 6. Naseri M, Safi Y, Akbarzadeh Baghban A, Khayat A, Eftekhar L. Survey of Anatomy and Root Canal Morphology of Maxillary First Molars Regarding Age and Gender in an Iranian Population Using Cone-Beam Computed Tomography. Iran Endod J. 2016;11(4):298-303. doi: 10.22037/iej.2016.8. [PubMed: 27790259]. [PubMed Central: PMC5069906]. 7. Parirokh M, Razifar M, Manochehrifar H, Abbott PV, Hatami N, Kashi N, et al. Treatment of a Maxillary Second Molar with One Buccal and Two Palatal Roots Confirmed with Cone-Beam Computed Tomography. Iran Endod J. 2017;12(3):371-5. doi: 10.22037/iej.v12i3.16331. [PubMed: 28808468]. [PubMed Central: PMC5527217]. 8. Rouhani A, Bagherpour A, Akbari M, Azizi M, Nejat A, Naghavi N. Cone-beam computed tomography evaluation of maxillary first and second molars in Iranian population: a morphological study. Iran Endod J. 2014;9(3):190-4. [PubMed: 25031592]. [PubMed Central: PMC4099950]. 9. Peikoff MD, Christie WH, Fogel HM. The maxillary second molar: variations in the number of roots and canals. Int Endod J. 1996;29(6):365-9. [PubMed: 10332235]. 10. Vertucci FJ. Root canal morphology and its relationship to endodontic procedures. Endodtopics. 2005;10(1):3-29. doi: 10.1111/j.1601-1546.2005.00129.x. 11. Alavi AM, Opasanon A, Ng YL, Gulabivala K. Root and canal morphology of Thai maxillary molars. Int Endod J. 2002;35(5):478-85. [PubMed: 12059921]. 12. Sert S, Bayirli GS. Evaluation of the root canal configurations of the mandibular and maxillary permanent teeth by gender in the Turkish population. J Endod. 2004;30(6):391-8. [PubMed: 15167464]. 13. Neelakantan P, Subbarao C, Ahuja R, Subbarao CV, Gutmann JL. Cone-beam computed tomography study of root and canal morphology of maxillary first and second molars in an Indian population. J Endod. 2010;36(10):1622-7. doi: 10.1016/j.joen.2010.07.006. [PubMed: 20850665]. 14. Versiani MA, Pecora JD, de Sousa-Neto MD. Root and root canal morphology of four-rooted maxillary second molars: a micro-computed tomography study. J Endod. 2012;38(7):977-82. doi: 10.1016/j.joen.2012.03.026. [PubMed: 22703664]. 15. Christie WH, Peikoff MD, Fogel HM. Maxillary molars with two palatal roots: A retrospective clinical study. J Endod. 1991;17(2):80-4. doi: 10.1016/s0099-2399(06)81613-4. 16. Stone LH, Stroner WF. Maxillary molars demonstrating more than one palatal root canal. Oral Surg Oral Med Oral Pathol. 1981;51(6):649-52. doi: 10.1016/s0030-4220(81)80017-5. 17. Kottoor J, Velmurugan N, Sudha R, Hemamalathi S. Maxillary first molar with seven root canals diagnosed with cone-beam computed tomography scanning: a case report. J Endod. 2010;36(5):915-21. doi: 10.1016/j.joen.2009.12.015. [PubMed: 20416446]. 18. 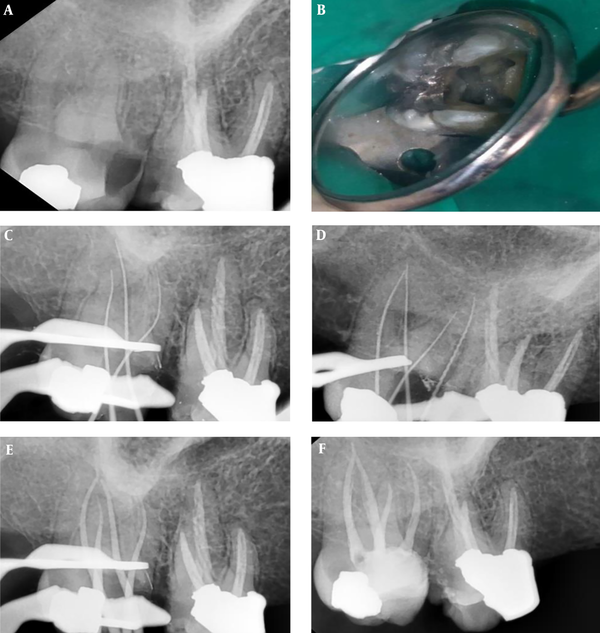 Kottoor J, Velmurugan N, Surendran S. Endodontic management of a maxillary first molar with eight root canal systems evaluated using cone-beam computed tomography scanning: a case report. J Endod. 2011;37(5):715-9. doi: 10.1016/j.joen.2011.01.008. [PubMed: 21496678]. 19. Silva EJ, Nejaim Y, Silva AI, Haiter-Neto F, Zaia AA, Cohenca N. Evaluation of root canal configuration of maxillary molars in a Brazilian population using cone-beam computed tomographic imaging: an in vivo study. J Endod. 2014;40(2):173-6. doi: 10.1016/j.joen.2013.10.002. [PubMed: 24461399]. 20. Benenati FW. Maxillary second molar with two palatal canals and a palatogingival groove. J Endod. 1985;11(7):308-10. doi: 10.1016/s0099-2399(85)80163-1. 21. Brown J, Jacobs R, Levring Jaghagen E, Lindh C, Baksi G, Schulze D, et al. Basic training requirements for the use of dental CBCT by dentists: a position paper prepared by the European Academy of DentoMaxilloFacial Radiology. Dentomaxillofac Radiol. 2014;43(1):20130291. doi: 10.1259/dmfr.20130291. [PubMed: 24132023]. [PubMed Central: PMC3887486]. 22. Saberi EA, Rasooli H, Movassagh Z. Retreatment of a mandibular second premolar with three roots: a case report. Iran Endod J. 2014;9(2):158-60. [PubMed: 24688588]. [PubMed Central: PMC3961835].